I’m not going to critique this film for its bastardisation of history. I don’t think that’s my duty as a reviewer—nor do I think that it is any film’s duty to stay entirely true to the story it’s based on. A piece of art should stand on its own two feet and be judged as such. That said, if you're going to dramatise history, everything you change or put in, as with any aspect of a film, should be purposeful. So yes, while I found the film’s use of real historical footage egregious at best, it’s not because I found any disrespect in it, but rather because it unnecessarily broke the already juttering flow of the film. 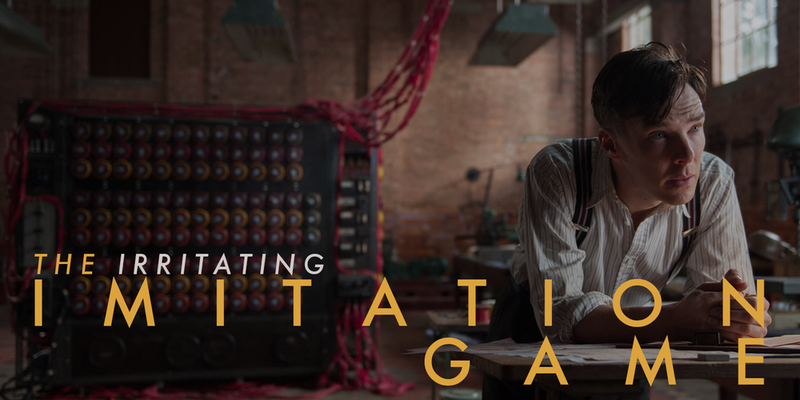 One of the key issues with The Imitation Game is that at its core it’s just that—an imitation. As Turing, Benedict Cumberbatch has been typecast as a less interesting version of his titular Sherlock in the BBC show. This casting decision was deliberate, but screenwriter Grahame Moore can’t quite pull off the humour here in the way that the show does, and as a result a lot of the screenplay feels forced, as though the film is trying to be funnier than its tone allows for. That said of course, Cumberbatch is a great actor and he isn’t entirely wasted here. There are some incredibly nuanced moments captured in the closeups of his face, and in the imperceptible flickers of emotions he manages to capture. But the film never really has any standout moments beyond those occasional and brief shots. Sure, Cumberbatch is great—but the material he’s working with just isn’t. In fact, it’s messy. The whole film works within this vaguely framed narrative, taking place in three separate times that the film doesn’t always do a great job of signposting, and because every shot and scene looks more or less the same the visual cues (if any existed) were entirely lost on me. On top of all this, one of the time periods the film inhabits serves merely as a whole bunch of tedious and predictable flashbacks, which is a brilliant filmmaking device and don’t let anyone tell you different. What bothers me most about the film is that it does nothing particularly interesting with the story of Alan Turing, who is arguably the most important figure of the last hundred years. In fact, it reduces him to an oversimplified caricature whose mannerisms serve only to create weak jokes along the lines of ‘he’s vaguely autistic and isn’t that hilarious’. It’s not that I’m at all offended by the film’s treatment of his vague illness or of history itself; it’s just that I’ve seen this sorta thing before and I’m looking for something more nuanced in a film about Turing than what Peter Moffatt delivers to me three times a year on the BBC. And speaking of the lack of nuance, this film has a delightful tendency to pat its audience on the back for how socially progressive we are compared to the 1950s. ‘Hey, being gay didn’t used to be so cool’; ‘women couldn’t work back then haha how absurd’—the film screams these things at us, as though we have to be told how great we are for having made progress as a society since 1951. But guess what? It’s not 1951, and these observations aren’t interesting, which makes me wonder why the film foregrounds these sort of self-congratulatory moments early on and then later decides to brush over the brutality of Turing’s chemical castration. The film’s social conscience comes to feel then, like the humour, heavily manufactured and totally off-kilter with what the film should be focussing on—the greatness of Alan Turing, and the nuance of his brilliance, and the tragedy of his death. With a film like this it’s simple: if you’re going to paint me a bland picture of something beautiful then I’m going to ask why you chose to paint it at all.